Home Tags Posts tagged with "Gaddaffi"
“Operation Mermaid Dawn” has succeeded, after six months of civil war, the events concluded in just a few hours, the rebels have reached the centre of the Libya’s capital, Tripoli. 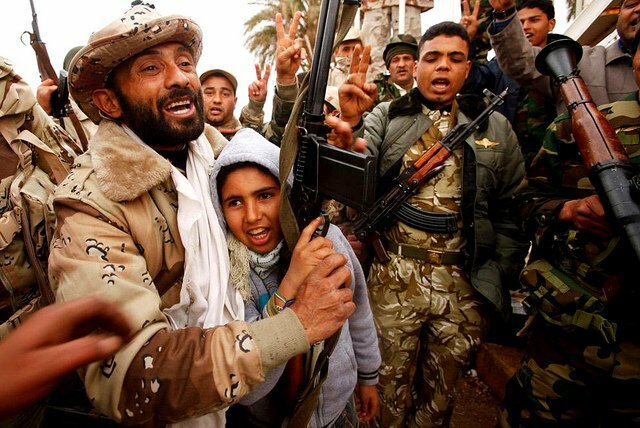 [googlead tip=”patrat_mediu” aliniat=”stanga”]Muammar Gaddafi’s defenders have fled, and thousands of civilians went out to cheer the the rebels while they were advancing into the city. The people gathered in the Green Square shouting “We’re free” and they shoot at a poster of Gaddafi, reported Al Jazeera. There was not much resistance from Gaddafi’s supporters while the were approaching the Libyan capital. “People are worried about sleeper cells but cleaning up operations are under way to make sure there are no snipers in the buildings nearby. People are confident that the government has fallen and they are in control”said Zeina Khodr, Al Jazeera’s correspondent. The capital has surrendered along with the military unit that was protecting Muammar al Gaddafi, said a rebel official (AP). There was no co-ordination between NATO air forces and the rebels forces on the ground, said Oana Lungescu, NATO’s chief spokeswoman. “What we’re seeing tonight is the regime crumbling,” Oana Lungescu told AFP. There is no information on Libya‘s former leader, Moammar Gadhafi, but two of his sons are in the rebels’ custody. In his latest message, Gaddaffi said Tripoli would be turned into another Baghdad. Mohammed, Gaddafi’s eldest son, has surrendered and told Al Jazeera that the revolution was caused by a lack of wisdom. “I’ve never been a government or security official, however I can tell you the absence of wisdom and foresight is what brought us to here today. Our differences could have been solved easily,” he said. His house was attacked while he was speaking, but head of the NTC told Al Jazeera that Mohammed was not hurt. [googlead tip=”patrat_mic” aliniat=”dreapta”]”He will remain in his house, and I guarantee his safety.” Mustafa Abdel Jalil said. Saif al-Islam, as Luis Moreno-Ocampo, the prosecutor of the International Criminal Court, confirmed was arrested and probably he will be transferred to The Hague, if the NTC agrees. Barak Obama said Gaddafi must “acknowledge the reality that he no longer controls Libya. He needs to relinquish power once and for all”. There were rumors about two South African air force planes that were seen at Tripoli airport, but Mahmoud Shamam, of the NTC told Al Jazeera, that the planes could not take Gaddafi since the airport was under rebel control. “I have no knowledge of any South African planes in Tripoli … but Nato should know, since they control the airport and no plane can land without their permission,” said Mohammed Dangor, South Africa’s ambassador to Libya.